Hot on the heels of a victory for Thaxted residents, Saffron Walden has achieved a solid victory of its own. After an appeal by developer Kier to build 300 homes, the Planning Inspectorate has upheld the refusal and so they will not be allowed to build. The decision also states useful precedents that should help protect the town in the future. residents nationally on BBC Town with Nicholas Crane in 2012. The primary reason for the dismissal of the Kier appeal was the unsustainable traffic impacts, which residents have been highlighting for several years. “The harm that I have identified in these respects in combination would be significant. On the basis of the detailed evidence before me, overall the proposals would not amount to sustainable development. I conclude that the appeal should be dismissed.” Kier Appeal Planning Inspector Mike Moore. The Kier site was promoted by the UDC Cabinet in their 2014 failed Local Plan. When rejecting the draft Local Plan, the Planning Inspectorate was critical of the impacts to traffic from building on the east of Saffron Walden. This second decision reaffirms those concerns. Kier’s application was originally refused by the UDC Planning Committee. The UDC Cabinet decided not to defend the refusal because they were unhappy with the Planning Committee going against their draft Local Plan. This left Saffron Walden Town Council and residents’ lobby group WeAreResidents.org to jointly fight the appeal and foot the £50,000 costs on their own. WeAreResidents.org is one of the founding organisations of Residents for Uttlesford (R4U). R4U was set up to give residents a real voice in what happens locally. The local party won 9 Uttlesford District Council seats in the May 2015 elections and is now the second party in the district and largest party on the Saffron Walden Town Council. Development not needed: The development was not needed because UDC was able to demonstrate that it had the required 5-year supply of new homes, even at the increased levels indicated by the Local Plan inspector in 2014. The full appeal dismissal notice can be downloaded and read here. Uttlesford has a 5-year supply of new homes: UDC is required to show it has a 5-year supply of new homes so that it can repel predatory development. The Inspector reconfirmed that this is the case and that UDC should be considered a only ‘five percent’ authority, i.e. one that needs to demonstrate a 105% supply of new homes because it has consistently met or nearly met this requirement. 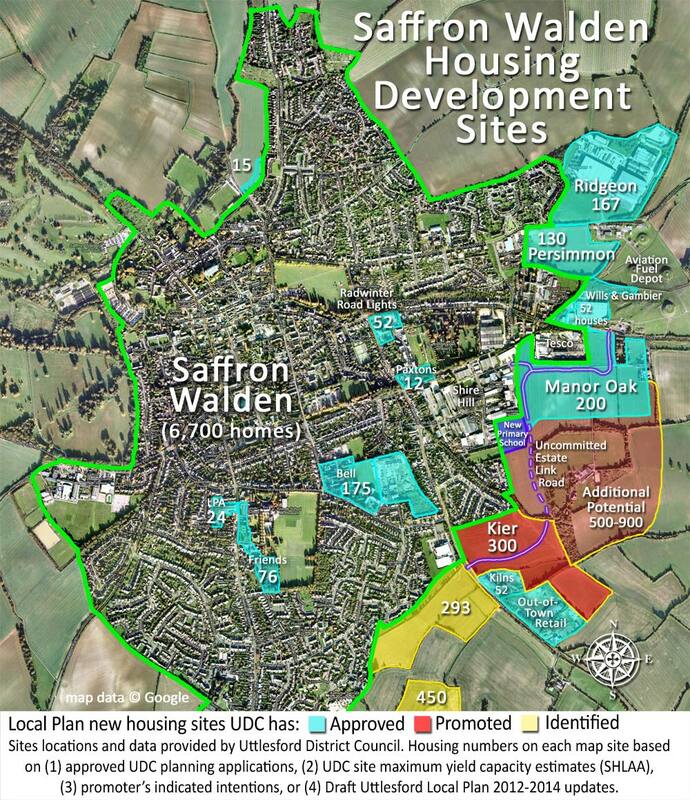 Saffron Walden’s road network can’t cope: The lack of a proper highways strategy for the whole town, inadequate funding, and no certainly over delivery all prevent future large-scale development of the east of Saffron Walden. This has been very confusing from the outset…What does this now mean regarding the other ‘applications’ put in with the housing e.g. School, Skate Park extension, Community Hub? If these are still allowed to go ahead then surely that opens the way for Kier at a later date? Joe you are right, it is confusing. Technically from a planning and appeal perspective the land that would be gifted is not dependent on the houses being built on the other side of the road. This is because the value of the land is far in excess of what is allowed under law via the ‘section-106’ agreement mechanism that UDC favours to extract benefits from developers. The Inspector highlights this in his appeal decision notice paragraph 56. However it would seem that the only reason that Kier are gifting the land is to try to get support for their housing application. Since the housing application has been refused it would seem unlikely that they would gift the land. It gets more confusing over the actual use of the land if it were to be gifted. It is our understanding that Kier have offered to gift the land, but not actually pay for anything on it. UDC indicated that the land would be used either for a school or sports facilities. The precedence would be on the school as there is a legal requirement for children to be educated. If a school were to be provided on the nearby Manor Oak site instead (i.e. Manor Oak was developed first), then the land could be available for sports. But the sports clubs would need to fund and apply for their own planning permission to develop their land for their own use. However all of that seems a moot point as Kier are unlikely to donate the land without the permission for their houses.